The Red Army Faction had, by this time, engaged in a campaign of armed struggle for seven years, beginning with the action that freed Andreas Baader from custody in 1970 – he had been serving a three-year sentence for setting fire to a department store to protest the war in Vietnam. Following the liberation of Baader, RAF members received training from Al Fatah in Jordan. After returning from Jordan, the guerilla carried out a series of bank robberies and began to prepare for campaigns to come. Then, in May 1972, the group turned things up a notch, carrying out a series of bombings. Targets included police stations and the U.S. army headquarters, which were blown up in protest against killer cops and the ongoing war in Vietnam. Four American soldiers were killed, and dozens of other people, including civilians, were injured. There followed a wave of repression as one hundred and thirty thousand cops, supported by both West German and U.S. intelligence units, set up checkpoints and carried out raids across the country. Within a few weeks the leading members of the RAF – Andreas Baader, Gudrun Ensslin, Holger Meins, Jan-Carl Raspe and Ulrike Meinhof – had all been captured. Yet the State was not content to simply remove the perceived leadership of the RAF from the field. Instead, it hoped to render them ineffective not only as combatants, but also as spokespeople for anti-imperialist resistance. If at all possible, they were to be deconstructed as human beings and reconstructed as representatives of the counterinsurgency project. If the latter was not possible, as a bare minimum, they were to be destroyed. The weapon for this campaign was complete and total isolation, both from each other and from the outside world. Yet, captured and isolated, the guerilla managed not only to survive but also turned things around. There were dozens of RAF members in prison, and dozens more political prisoners from other groups; through the strategic use of hunger strikes they called attention not only to their conditions of incarceration but also to their anti-imperialist armed struggle ideology. Prisoner support groups sprang up across the country, and when Holger Meins died in a 1974 hunger strike there were protests in cities across West Germany, thousands meeting in university auditoriums in West Berlin to discuss possible responses while thousands more braved the ban on demonstrations and took to the streets. The next day the 2nd of June Movement (2), a Berlin-based anarchist guerilla group shot and killed the president of the West Berlin Supreme Court to avenge Meins and support the demands of the prisoners. In April 1975, this came to pass: a group of guerillas, adopting the name “Holger Meins Commando”, stormed the West German embassy in Stockholm, taking twelve hostages. 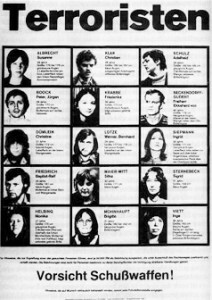 They demanded the release of twenty-six West German political prisoners including Ensslin, Meinhof, Raspe, and Baader. The West German government’s refusal to negotiate prompted the guerillas to execute the Military and Economic Attachés. After twelve hours, as police prepared to storm the building, the explosives the guerilla had laid detonated. One RAF member, Ulrich Wessel, was killed instantly. RAF members Siegfried Hausner, Hanna Krabbe, Karl-Heinz Dellwo, Lutz Taufer and Bernhard Rössner were all captured. 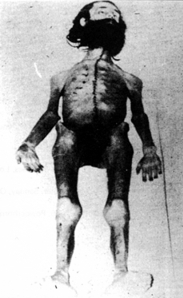 Despite the fact that he had a fractured skull and burns over most of his body, Hausner was only hospitalized for a few days, and then despite the objections of doctors in Sweden and Germany was flown to Stammheim Prison, where he died soon after. The State had attempted to capitalize on its initial capture of the guerilla, only to find that from within prison they had managed to inspire their successors. Chancellor Helmut Schmidt went so far as to state that “anarchist guerillas” now posed the greatest threat the Federal Republic had encountered during its twenty-six year history (3). Destroying the prisoners, or at least undercutting their support, became a top priority. Fear mongering was stepped up, claims were made that the guerilla had nuclear weapons and was intent on kidnapping children to exchange for the prisoners. No claim was too ridiculous, as those few who had broken were paraded out as state witnesses, alleging all kinds of horrors. Proof, or even mildly convincing evidence, was no longer deemed necessary. Then on May 9, 1976, the state announced that Ulrike Meinhof had died in her cell, just as her trial was entering a critical phase. The authorities tried to spin a tale that Meinhof had committed suicide by hanging following a period of extreme depression provoked by tension between herself and her co-defendents, particularly between herself and Andreas Baader. The prisoners, and most of the left, immediately denounced this as impossible, and did not hesitate to accuse the State of killing the woman who many viewed as the RAF’s chief theoretician. 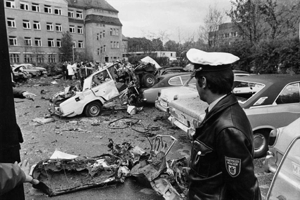 The day of her burial, there were bomb attacks in Hamm, West Germany; Rome, Italy; and Zurich, Switzerland. Three days later there was another demonstration of 8,000 people in West Berlin protesting her murder. 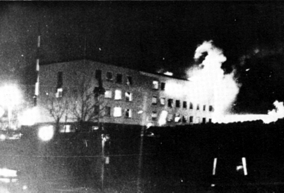 On June 2nd the Revolutionary Cells bombed the U.S. Army Headquarters and U.S. Officers’ club in Frankfurt, carrying out the attack under the name “Ulrike Meinhof Commando.” That same day, just outside of the city, two fully loaded military trucks at a U.S. Airbase were blown up. The defense attorneys called for the formation of an independent international commission of inquiry. As a result, an International Investigatory Commission into the Death of Ulrike Meinhof was formed; it took three years to release its findings, but in 1978 it indicated that there was evidence Meinhof had been brutally raped and murdered. This then was the context in which the events of 1977 were to unfold. These were the guerilla. This is what they had done. This is what the State had proven itself capable of. But the story was far from over. 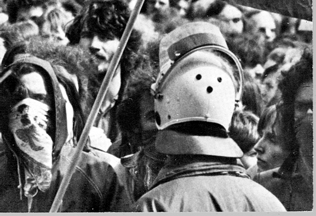 (1)Varon, Jeremy, Bringing the War Home: The Weather Underground, the Red Army Faction and Revolutionary Violence in the Sixties and Seventies, University of California Press Berkeley and Los Angeles, California: 2004. p. 199. (2) The 2nd of June Movement took its name form the date of a 1967 demonstration in West Berlin against a visit from the Shah of Iran. A young student named Benno Ohnesorg was shot and killed by police, and many other demonstrators were injured. This proved to be a significant turning point in left wing politics in West Germany. (4) Varon op cit. p. 234.